Our company is highly esteemed firm known for offering Shoe Rack to the clients, that is made up of the metal. These racks are easy to install and inexpensive, over the door shoe racks are incredibly popular and are a great way to keep shoes organize. Shoe rack are available in 3 sizes-small, medium & large. They are developed, processed and tested by the team of highly knowledgeable and experienced professional at advanced units. Its a metal powder coated shoe rack, wall mounted, takes hardly 5 inch space. 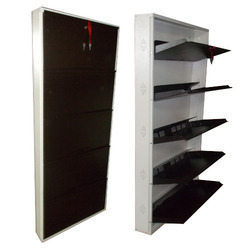 Size (Dimensions in Length X Breadth X Height) 54" x 26" x 6"
Size 41" x 19" x 5.5"
We offer a wide range of Metal Shoes Rack that is designed skillfully to maximize the space and offers easy solutions for storing the shoes in an organized manner. 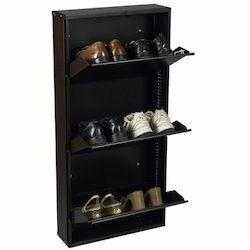 Consequently Metal Shoe Rack is highly durable and has more service life. Superior Quality, innovative designs and flawless finishing have made it possible to gain a competitive edge in the market. 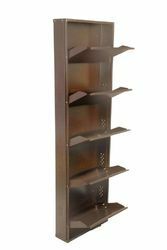 Metal Shoe Rack offered by professionals is made up of premium quality raw material and can be used in commercial as well as residential areas. 3 DOOR Regular 41" x 19" x 5.5"
3 DOOR Jumbo 41" x 28 x 5.5"
4DOOR Regular 54" x 19" x 5.5"
4 DOOR Jumbo 54" x 28" x 5.5"
5 DOOR Regular 67" x 19" x 5.5"
5 DOOR Jumbo 67" X 28" X 5.5"
We are counted amongst established manufacturers of superior Wall Mounted Metal Shoe Rackthat are exquisitely designed by our skilled professionals. During the manufacturing of the range, our team make use of good quality raw material and advanced process techniques so that clients receive products that offer value to their money. These racks can be availed in different sizes, designs, finishes and other custom specifications. 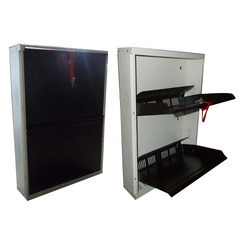 The rack is widely demanded by the clients for its durability and quality. Acknowledged for dimensional accuracy, durability, high strength and low maintenance, our range of Slim Racks is ideal for bulk palletized loads. Manufactured using high quality raw material, these products are also used for keeping lumber and sheet goods, drum slim and other products in bulk quantity. Available in various designs and sizes, these products can also be customized to meet the specific requirements of the clients. Offered at most competitive prices, the range is timely delivered at clients destination. 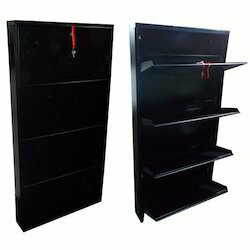 Product Dimensions (length x breadth x height) 41" x 20" x 6"
We are manufacturer and supplier of Shoe Rack Cabinet in different sizes of dimensions as per the size and the shape of room or office so that the empty space can be used well to store the shoes and to hide them appropriately. Metal Shoe Rack offered by professionals is made up of premium quality raw material and can be offer these shoe racks at very reasonable price rates. We are one of the leading manufacturers and suppliers of a designer range of Shoe Racks. Every product goes through stringent checks to ensure quality and longevity. Every step is carefully monitored and controlled, these products require minimum maintenance and are appreciated for termite free and good quality. These shoes racks we offer to our clients are made from finest quality wood which are processed and polished by our team of craftsmen. 6. Fixed on Wall with 4 Screws..